Save $5 when you buy 2 Ozery Bakery products. Save $2 on Dave's Killer bread. Buy one and get one Free D'Italiano buns. Buy one and get one Free Wonder Buns. Save $1 on any Wonder bread. Save $1 on Dempster's Deluxe The Gold Bun product. Save $1 on Ozery Bakery Brioche product. Save $1 when you purchase 2 Wonder bread loaves. Save $1 on Villaggio Artesano bread. Save $1.00 on a package of Villaggio Artesano Bread. Save $1.00 on a package of NEW Villaggio Kaiser or Calabrese Buns. Save $0.75 on Furlani garlic bread product. Save $1 on any Dempster's white bread. 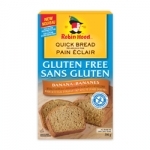 Save $1.25 on Robin Hood Gluten-Free Banana Flavoured Quick Bread Mix. Save $1.50 when you buy 2 packages of Dempster's bagels. Save $1.00 on a package of Villaggio Toscana Sliced Bread. Valid only in ON/ATL.